1831: The University of Alabama opened its doors. The first courses offered were in liberal arts subjects: mathematics, history, modern and ancient languages, natural history, chemistry, philosophy, and literature. 1903: The Department of Geography was founded; it later became one of the first official departments within the College of Arts and Sciences.  1909: The University organized its science and humanities courses into a new academic unit: the College of Arts and Sciences. Charles Hayward Barnwell was appointed dean of the fledgling College, a position he held until 1944. 1927: Department of Sociology formed. 1941: The first anthropology courses were taught at the University. 1944: Marten ten Hoor (for whom ten Hoor Hall is named) was appointed dean of the College, a position he held until 1960. During his tenure, eight PhD programs were created within A&S, and faculty members gained unprecedented academic freedom and influence over curriculum and administrative matters. 1945: The Department of Art and Art History was founded; it was the first such department in the state. 1952: The University awarded its first two doctorates, in chemistry and history. 1955: The Department of Theatre and Dance was founded. 1960: Hubert Emery Mate was named dean of the College. 1961: The Department of Modern Languages and Classics was founded. 1963: The history, political science, and philosophy departments were founded. 1966: Raymond Francis McLain was appointed dean of the College. 1967: Three departments were founded: anthropology, mathematics, and psychology. McLain stepped down as dean and was replaced by Frederick William Connor, who served until 1968. 1969: Douglas E. Jones, an alumnus and former chair of the Department of Geology and Geography, was appointed dean of the College. 1971: New College was founded to offer ambitious, responsible, and self-disciplined students a way to craft their own majors and minors from courses across several disciplines. The Department of Criminal Justice department was also founded this year. 1984: Jones retired as the dean of the College of Arts and Sciences. 1986: Richard Earl Peck was appointed dean of the College; he served until 1988, when Henry Charles Rickard was named dean. 1989: James D. Yarbrough became dean of the College of Arts and Sciences. 1999: The College’s Blount Undergraduate Initiative, an innovative liberal-arts living-learning community devoted to the examination of foundational works, accepted its first students. 2000: Yarbrough retired as dean of the College; he was succeeded by Dr. Robert Olin, under whose leadership the College opened the Mathematics Technology Learning Center, a 240-computer math learning community. 2004: Shelby Hall was completed; at more than 200,000 square feet, the $60 million structure is one of the largest academic research buildings in the region. The Department of Chemistry and Biochemistry is based in Shelby, which also houses facilities for interdisciplinary research in transportation, geosciences, energy, biosciences, and material sciences. For more information about Shelby Hall, visit http://shelbyhall.ua.edu. 2009: The Department of Gender and Race Studies was established when the African-American Studies Program merged with the Department of Women’s Studies. 2011: The College opened an outdoor learning center at the 480-acre J. Nicholene Bishop Biological Station, known as “Tanglewood,” in Akron, Alabama. The new structure supports the study of forest, wildlife, recreation, and aesthetics management by students in the recently created natural resources minor, as well as other programs. 2012: The Paul Jones Museum of Art opens in downtown Tuscaloosa. The gallery honors Paul R. Jones, who donated 1,700 pieces from his renowned collection of African-American art to the College in 2008. We welcome additional information about significant events in our history. Contact us at webmaster@as.ua.edu.